Structuralism, as a term refers to various theories across the humanities, social sciences and economics many of which share the assumption that structural relationships between concepts vary between different cultures/languages and that these relationships can be usefully exposed and explored. 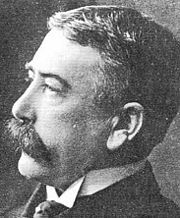 Ferdinand de Saussure (November 26, 1857 – February 22, 1913) was a Swiss linguist whose ideas laid the foundation for many of the significant developments in linguistics in the twentieth century. He is widely considered the "father" of twentieth-century linguistics, and his work laid the foundation for the approach known as structuralism in the broader field of the social sciences. Although his work established the essential framework of future studies, his ideas contained many limitations and fundamental weaknesses as later scholars recognized that underlying structure and rules, while informative, cannot be the sole determinant of meaning and value in any social system. Saussure's most influential work, the Cours de linguistique générale (Course of General Linguistics), was published posthumously in 1916 by former students Charles Bally and Albert Sechehaye on the basis of notes taken from Saussure's lectures at the University of Geneva. The Cours became one of the seminal linguistics works of the twentieth century, not primarily for the content (many of the ideas had been anticipated in the works of other nineteenth-century linguists), but rather for the innovative approach that Saussure applied in discussing linguistic phenomena. The dominant philosophical system of each age makes its imprint on each step in the evolution of linguistic science.The nineteenth century had a fragmentary approach to reality which prevented scholars from getting beyond the immediate facts in matters of speech. To those investigators, language was simply an inventory or mechanical sum of the units used in speaking. Piecemeal studies precluded the development of an insight into the structure (Gestalteinheit, pattern, or whole) into which the fragmentary facts fit. The atomistic conception of speech, reflected in the historical studies of the comparative philologists, had to give way to the functional and structural conception of language. But what is language [langue]? It is both a social product of the faculty of speech and a collection of necessary conventions that have been adopted by a social body to permit individuals to exercise that faculty. It is not to be confused with human speech [langage]. Language is only a definite part, though certainly an essential one of human speech. Human speech is many-sided and heterogeneous; straddling several areas simultaneously - physical, physiological, and psychological - it belongs both to the individual and to society; we cannot put it into any category of human facts, for we cannot discover its unity. To give language first place in the study of speech, we can advance a final argument: the faculty of articulating words - whether it is natural or not - is exercised only with the help of the instrument created by a collectivity and provided for its use; therefore, to say that language gives unity to speech is not fanciful. In order to separate from the whole of speech the part that belongs to language, we must examine the individual act from which the speaking-circuit can be reconstructed. The act requires the presence of at least two persons; that is the minimum number necessary to complete the circuit. Suppose that the opening of the circuit is in A's brain, where mental facts (concepts) are associated with representations of the linguistic sounds (sound-images) that are used for their expression. A given concept unlocks a corresponding sound-image in the brain; this purely psychological phenomenon is followed in turn by a physiological process: the brain transmits an impulse corresponding to the image to the organs used in producing sounds. Then the sound waves travel from the mouth of A to the ear of B: a purely physical process. Next, the circuit continues in B, but the order is reversed: from the ear to the brain, the physiological transmission of the sound-image; in the brain, the psychological association of the image with the corresponding concept. If B then speaks, the new act will follow-from his brain to A's-exactly the same course as the first act and pass through the same successive phases, which I shall diagram as image on the upper right. Among all the individuals that are linked together by speech, all will reproduce-not exactly of course, but approximately-the same signs united with the same concepts. How does the social crystallization of language come about? Which parts of the circuit are involved? For all parts probably do not participate equally in it. The nonpsychological part can be rejected from the outset. When we hear people speaking a language that we do not know, we perceive the sounds but remain outside the social fact because we do not understand them. Neither is the psychological part of the circuit wholly responsible: the executive side is missing, for execution is never-carried out by the collectivity. Execution is always individual, and the individual is always its master: I shall call the executive side speaking [parole]. 1) Language is a well-defined object in the heterogeneous mass of speech facts. It can be localized in the limited segment of the speaking-circuit where an auditory image becomes associated with a concept. It is the social side of speech, outside the individual who can never create nor modify it by himself; it exists only by virtue of a sort of contract signed by the members of a community. Moreover, the individual must always serve an apprenticeship in order to learn the functioning of language; a child assimilates it only gradually. It is such a distinct thing that a man deprived of the use of speaking retains it provided that he understands the vocal signs that he hears. 2) Language, unlike speaking, is something that we can study separately. Although dead languages are no longer spoken, we can easily assimilate their linguistic organisms. We can dispense with the other elements of speech; indeed, the science of language is possible only if the other elements are excluded. 3) Whereas speech is heterogeneous, language, as defined, is homogeneous. It is a system of signs in which the only essential thing is the union of meanings and sound-images, and in which both parts of the sign are psychological. 4) Language is concrete, no less so than speaking; and this is a help in our study of it. Linguistic signs, though basically psychological, are not abstractions; associations which bear the stamp of collective approval-and which added together constitute language -are realities that have their seat in the brain. Besides, linguistic signs are tangible; it is possible to reduce them to conventional written symbols, whereas it would be impossible to provide detailed photographs of acts of speaking [actes de parole] ; the pronunciation of even the smallest word represents an infinite number of muscular movements that could be identified and put into graphic form only with great difficulty. In language, on the contrary, there is only the sound-image, and the latter can be translated into a fixed visual image. 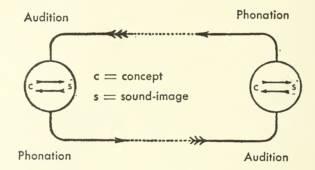 For if we disregard the vast number of movements necessary for the realization of sound-images in speaking, we see that each sound-image is nothing more than the sum of a limited number of elements or phonemes that can in turn be called up by a corresponding number of written symbols. The very possibility of putting the things that relate to language into graphic form allows dictionaries and grammars to represent it accurately, for language is a storehouse of sound-images, and writing is the tangible form of those images. The foregoing characteristics of language 'reveal an even more important characteristic. Language, once its boundaries have been marked off within the speech data, can be classified among human phenomena, whereas speech cannot. We have just seen that language is a social institution; but several features set it apart from other political, legal, etc. institutions. We must call in a new type of facts in order to illuminate the special nature of language. Language is a system of signs that express ideas, and is therefore comparable to a system of writing, the alphabet of deaf-mutes, symbolic rites, polite formulas, military signals, etc. But it is the most important of all these systems. A science that studies the life of signs within society is conceivable; it would be a part of social psychology and consequently of general psychology; I shall call it semiology (from Greek semefon 'sign'). Semiology would show what constitutes signs, what laws govern them. Since the science does not yet exist, no one can say what it would be; but it has a right to existence, a place staked out in advance. Linguistics is only a part of the general science of semiology; the laws discovered by semiology will be applicable to linguistics, and the latter will circumscribe a well-defined area within the mass of anthropological facts. To determine the exact place of semiology is the task of the psychologist! The task of the linguist is to find out what makes language a special system within the mass of semiological data. This issue will be taken up again later; here I wish merely to call attention to one thing: if I have succeeded in assigning linguistics a place among the sciences, it is because I have related it to semiology. This conception is open to criticism at several points. It assumes that ready-made ideas exist before words; it does not tell us whether a name is vocal or psychological in nature (arbor, for instance, can be considered from either viewpoint); finally, it lets us assume that the linking of a name and a thing is a very simple operation-an assumption that is anything but true. But this rather naive approach can bring us near the truth by showing us that the linguistic unit is a double entity, one formed by the associating of two terms. Both terms involved in the linguistic sign are psychological and are united in the brain by an associative bond. The linguistic sign unites, not a thing and a name, but a concept and a sound-image. The latter is not the material sound, a purely physical thing, but the psychological imprint of the sound, the impression that it makes on our senses. The sound-image is sensory, and if I happen to call it "material," it is only in that sense, and by way of opposing it to the other term of the association, the concept, which is generally more abstract. The two elements are intimately united, and each recalls the other. 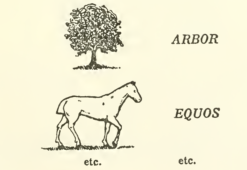 Whether we try to find the meaning of the Latin word arbor or the word that Latin uses to designate the concept "tree," it is clear that only the associations sanctioned by that language appear to us to conform to reality, and we disregard whatever others might be imagined. Our definition of the linguistic sign poses an important question of terminology. I call the combination of a concept and a sound-image a sign, but in current usage the term generally designates only a sound-image, a word, for example (arbor, etc.). One tends to forget that arbor is called a sign only because it carries the concept "tree," with the result that the idea of the sensory part implies the idea of the whole. Ambiguity would disappear if the three notions involved here were designated by three names, each suggesting and opposing the others. I propose to retain the word sign [signe] to designate the whole and to replace concept and sound-image respectively by signified [signifre] and signifier [signifiant]; the last two terms have the advantage of indicating the opposition that separates them from each other and from the whole of which they are parts. As regards sign, if I am satisfied with it, this is simply because I do not know of any word to replace it, the ordinary language suggesting no other. No one disputes the principle of the arbitrary nature of the sign, but it is often easier to discover a truth than to assign to it its proper place. Principle I dominates all the linguistics of language; its consequences are numberless. It is true that not all of them are equally obvious at first glance; only after many detours does one discover them, and with them the primordial importance of the principle. While Principle II is obvious, apparently linguists have always neglected to state it, doubtless because they found it too simple; nevertheless, it is fundamental, and its consequences are incalculable. Its importance equals that of Principle I; the whole mechanism of language depends upon it. In contrast to visual signifiers (nautical signals, etc.) which can offer simultaneous groupings in several dimensions, auditory signifiers have at their command only the dimension of time. Their elements are presented in succession; they form a chain. This feature becomes readily apparent when they are represented in writing and the spatial line of graphic marks is substituted for succession in time. According to Saussure, language is made up of signs. Signs are comprised of signifiers (sounds or words) and signifieds (concepts, ideas, or things). A particular language (as a system of signs) names and organizes a world of and designates/determines its value. For Saussure, the sign must be conceived as adhering to two fundamental principles. First, the connection between the signifier (as a sound, scriptive symbol, or word) and the signified (the concept, idea, or referent), is arbitrary. Language is not as “natural” as it seems, but is the product of collective behaviors and social conventions. The sign is the “register” within the extension of the history and culture of its users. Saussure’s second principle argues that the signifier is essentially linear in nature and not only occurs in time but is contingent upon a temporal unfolding. The signifier represents a measurable time and exists within a chain of other signifiers. The implicit “meaning” of a signifier is contingent upon that meaning being conveyed through a chain of signifiers or words; for example, a sentence wherein the noun is modified by a verb and an adjective. Consequently, language is a system of terms in which the value of each term depends upon the presence of other terms in the signifying chain. Within that chain, the contingency of terms occurs within a system of phonic and conceptional difference; where a word or concept can be differentiated from another word or concept. Language and meaning depend upon the vital distinction between signifiers and signifieds, and the entire system itself is predicated upon differences. The arbitrary of signifier/signified relationship, the temporal nature of the act of signification, and the centrality of difference as the governing force of any act of language have significant bearing upon the nature of signifier and signified. Because the act of signification is arbitrary, any meaning implicit within a language is in effect the result of cultural assumptions, ideas, and biases. Since the signifier is linear and unfolds temporally, the act of signification occurs as a chain of signifiers that do not embody meaning, rather meaning is perpetually deferred and passed through the chain. As such, meaning is conveyed as a trace through the sentence or chain or signifiers. If meaning is not inherent in the relationship of the signifier and signified (nor in the sign itself), then meaning is not manifest in the signifying process at all. This is a concept or governing principle that imbues the entire language system with meaning. 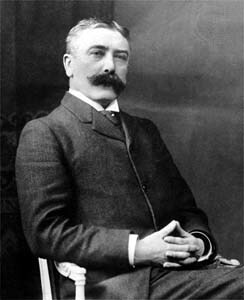 Saussure’s achievement came in distinguishing, in language, the synchrony of langue from the diachrony of parole (speech), with the former consisting in the “treasure hoard deposited” by subjects of a speech community in their speech arts. … In the art of parole the speaker can change the meaning of the signifier or invent new signifiers, but this creativity is controlled by the acceptance or rejection of the new product by the speech community. Freeing the sign from its object in the world, Saussure initiated the concept of the arbitrariness of signification in the formation of language. Saussure’s linguistic turn offers post-structuralists an opportunity to advance a theory of language in which signs take on meaning in opposition to other signs within the same system. While Saussure’s emphasis was on spoken word, post-structuralists focused on writing and the differential sign-system, rejecting the nomenclaturist position. Within postmodern studies, Saussure’s linguistic turn and the subsequent post-structuralist turn allow for a textual semiotics that point toward the significance of language at the center of intellectual inquiry. Saussure’s structuralism applied to the cultural space offers an interrogation of forces that not only shape but create meaning and value in the humanities and social sciences. The signifier, though to a appearances freely chosen with respect to the idea that it represents, is fixed, not free, with respect to the linguistic community that uses it. The masses have no voice in the matter, and the signifier chosen by language could be replaced by no other. 2. Mutability Time, which insures the continuity of language, wields another influence apparently contradictory to the first: the more or less rapid change of linguistic signs. In a certain sense, therefore, we can speak of both the immutability and the mutability of the sign. In the last analysis, the two facts are interdependent: the sign is exposed to alteration because it perpetuates itself. What predominates in all change is the persistence of the old substance; disregard for the past is only relative. That is why the principle of change is based on the principle of continuity. Language is radically powerless to defend itself against the forces which from one moment to the next are shifting the relationship between the signified and the signifier. This is one of the consequences of the arbitrary nature of the sign. Unlike language, other human institutions-customs, laws, etc. -are all based in varying degrees on the natural relations of things; all have of necessity adapted the means employed to the ends pursued. Even fashion in dress is not entirely arbitrary; we can deviate only slightly from the conditions dictated by the human body. Language is limited by nothing in the choice of means, for apparently nothing would prevent the associating of any idea whatsoever with just any sequence of sounds. Mutability is so inescapable that it even holds true for artificial languages. …. Signs are governed by a principle of general semiology: continuity in time is coupled to change in time; this is confirmed by orthographic systems, the speech of deaf-mutes, etc. …. Time changes all things; there is no reason why language should escape this universal law. 1) Individual aspect: Within the total phenomenon represented by speech we first singled out two parts: language and speaking. Language is speech less speaking. It is the whole set of linguistic habits which allow an individual to understand and to be understood. 2) Social aspect: For the realization of language, a community of speakers [masse parlante] is necessary. Contrary to all appearances, language never exists apart from the social fact, for it is a semiological phenomenon. 3) Historical aspect: The linguistic sign is arbitrary; language, as defined, would therefore seem to be a system which, because it depends solely on a rational principle, is free and can be organized at will. Its social nature, considered independently, does not definitely rule out this viewpoint. Doubtless it is not on a purely logical basis that group psychology operates; one must consider everything that deflects reason in actual contacts between individuals. But the thing which keeps language from being a simple convention that can be modified at the whim of interested parties is not its social nature; it is rather the action of -time combined with the social force. If time is left out, the linguistic facts are incomplete and no conclusion is possible. If we considered language in time, without the community of speakers-imagine an isolated individual living for several centuries, we probably would notice no change - time would not influence language. Conversely, if we considered the community of speakers without considering time, we would not see the effect of the social forces that influence language. Language is no longer free, for time will allow the social forces at work on it to carry out their effects. This brings us back to the principle of continuity, which cancels freedom. But continuity necessarily implies change, varying degrees of shifts in the relationship between the signified and the signifier. Very few linguists suspect that the intervention of the factor of time creates difficulties peculiar to linguistics and opens to their science two completely divergent paths. Most other sciences are unaffected by this radical duality; time produces no special effects in them. …. On the contrary, that duality is already forcing itself upon the economic sciences. A similar necessity obliges us to divide linguistics into two parts, each with its own principle. Here as in political economy we are confronted with the notion of value; both sciences are concerned with a system for equating things of different orders - labor and wages in one and a signified and signifier in the other. For a science concerned with values the distinction is a practical necessity and sometimes an absolute one. In these fields scholars cannot organize their research rigorously without … making a distinction between the system of values per se and the same values as they relate to time. This distinction has to be heeded by the linguist above all others, for language is a system of pure values which are determined by nothing except the momentary arrangement of its terms. A value — so long as it is somehow rooted in things and in their natural relations, as happens with economics (the value of a plot of ground, for instance, is related to its productivity) — can to some extent be traced in time if we remember that it depends at each moment upon a system of coexisting values. Its link with things gives it, perforce, a natural basis, and the judgments that we base on such values are therefore never completely arbitrary; their variability is limited. But we have just seen that natural data have no place in linguistics. Again, the more complex and rigorously organized a system of values is, the more it is necessary, because of its very complexity, to study it according to both co-ordinates. No other system embodies this feature to the same extent as language. Nowhere else do we find such precise values at stake and such a great number and diversity of terms, all so rigidly interdependent. The multiplicity of signs, which we have already used to explain the continuity of language, makes it absolutely impossible to study simultaneously relations in time and relations within the system. The reasons for distinguishing two sciences of language are clear. How should the sciences be designated? ….. I prefer to speak of synchronic and diachronic linguistics. Everything that relates to the static side of our science is synchronic; everything that has to do with evolution is diachronic. Similarly, synchrony and diachrony designate respectively a language-state and an evolutionary phase. The first thing that strikes us when we study the facts of language is that their succession in time does not exist insofar as the speaker is concerned. He is confronted with a state. That is why the linguist who wishes to understand a state must discard all knowledge of everything that produced it and ignore diachrony. He can enter the mind of speakers only by completely suppressing the past. The intervention of history can only falsify his judgment. Ever since modern linguistics came into existence, it has been completely absorbed in diachrony. …. Classical grammar has been criticized as unscientific; still, its basis is less open to criticism and its data are better defined than is true of the linguistics started by Bopp. The latter, occupying ill-defined ground, has no clear-cut objective. It straddles two areas because it is unable to make a sharp distinction between states and successions. Linguistics, having accorded too large a place to history, will turn back to the static viewpoint of traditional grammar but in a new spirit and with other procedures, and the historical method will have contributed to this rejuvenation; the historical method will in turn give a better understanding of language-states. The old grammar saw only the synchronic fact; linguistics has revealed a new class of phenomena; but that is not enough; one must sense the opposition between the two classes of facts to draw out all its consequences. The opposition between the two viewpoints, the synchronic and the diachronic, is absolute and allows no compromise. A few facts will show what the difference is and why it is irreducible. …..
All this confirms the principles previously stated. To summarize: Language is a system whose parts can and must all be considered in their synchronic solidarity. But of all comparisons that might be imagined, the most friutful is the one that might be drawn between the functioning of language and a game of chess. In both instances we are confronted with a system of values and their observable modifications. A game of chess is like an artificial realization of what language offers in a natural form. Let us examine the matter more carefully. First, a state of the set of chessmen corresponds closely to a state of language. The respective value of the pieces depends on their position on the chessboard just as each linguistic term derives its value from its opposition to all the other terms. In the second place, the system is always momentary; it varies from one position to the next. It is also true that values depend above all else on an unchangeable convention, the set of rules that exists before a game begins and persists after each move. Rules that are agreed upon once and for all exist in language too; they are the constant principles of semiology. Finally, to pass from one state of equilibrium to the next, or — according to our terminology — from one synchrony to the next, only one chesspiece has to be moved ; there is no general rummage. Here we have the counterpart of the diachronic phenomenon with all its peculiarities. Everywhere the opposition between diachrony and synchrony stands out. For instance — and to begin with the most apparent fact — they are not of equal importance. Here it is evident that the synchronic viewpoint predominates, for it is the true and only reality to the community of speakers. The same is true of the linguist: if he takes the diachronic perspective, he no longer observes language but rather a series of events that modify it. People often affirm that nothing is more important than understanding the genesis of a particular state; this is true in a certain sense: the forces that have shaped the state illuminate its true nature, and knowing them protects us against certain illusions; but this only goes to prove clearly that diachronic linguistics is not an end in itself. It is a popular practice to speak of laws in linguistics. But are the facts of language actually governed by laws? If so, what are they like? Since language is a social institution, one might assume a priori that it is governed by prescriptions analogous to those that control communities. Now every social law has two basic characteristics: it is imperative and it is general; it comes in by force and it covers all cases - within certain limits of time and place, of course. To summarize: synchronic facts, no matter what they are, evidence a certain regularity but are in no way imperative; diachronic facts, on the contrary, force themselves upon language but are in no way general. In a word, neither of the two classes of facts is governed by laws in the sense defined above, and if one still wishes to speak of linguistic laws, the word will embrace completely different meanings, depending on whether it designates facts of one class or the other. 7. Is There a Panchronic Viewpoint? Up to this point the term law has been used in the legal sense. But cannot the term also be used in language as in the physical and natural sciences, i.e. in the sense of relations that are everywhere and forever verifiable? In a word, can not language be studied from a panchronic viewpoint? Doubtless. Since phonetic changes have always occurred and are still occurring, this general phenomenon is a permanent characteristic of speech; it is therefore one of the laws of speech. In linguistics as in chess (see pp. 88 ff.) there are rules that outlive all events. But they are general principles existing independently of concrete facts. When we speak of particular, tangible facts, there is no panchronic viewpoint. Each phonetic change, regardless of its actual spread, is limited to a definite time and territory; no change occurs at all times and in all places; change exists only diachronically. These general principles are precisely what serve as a criterion for determining what belongs to language and what does not. A concrete fact that lends itself to panchronic explanation cannot belong to language. (a) Synchronic truth seems to be the denial of diachronic truth, and one who has a superficial view of things imagines that a choice must be made; this is really unnecessary; one truth does not exclude the other. (b) Synchronic truth is so similar to diachronic truth that people confuse the two or think it superfluous to separate them. Linguistics here comes to its second bifurcaton. We had first to choose between language and speaking; here we are again at the intersection of two roads, one leading to diachrony and the other to synchrony. Once in possession of this double principle of classification, we can add that everything diachronic in language is diachronic only by virtue of speaking. It is in speaking that the germ of all change is found. Each change is launched by a certain number of individuals before it is accepted for general use. Modern German uses ich war, wir waren, whereas until the sixteenth century the conjugation was ich was, wir waren (cf. English I was, we were). How did the substitution of war for was come about? Some speakers, influenced by waren, created war through analogy; this was a fact of speaking; the new form, repeated many times and accepted by the community, became a fact of language. But not all innovations of speaking have the same success, and so long as they remain individual, they may be ignored, for we are studying language; they do not enter into our field of observation until the community of speakers has adopted them. An evolutionary fact is always preceded by a fact, or rather by a multitude of similar facts, in the sphere of speaking. This in no way invalidates but rather strengthens the distinction made above since in the history of any innovation there are always two distinct moments: (1) when it sprang up in individual usage; and (2) when it became a fact of language, outwardly identical but adopted by the community. One must recognize that the ideal, theoretical form of a science is not always the one imposed upon it by the exigencies of practice ; in Unguistics these exigencies are more imperious than anywhere else ; they account to some extent for the confusion that now pre- dominates in linguistic research. Even if the distinctions set up here were accepted once and for all, a precise orientation probably could not be imposed on investigations in the name of the stated ideal. In the synchronic study of Old French, for instance, the linguist works with facts and principles that have nothing in common with those that he would find out by tracing the history of the same language from the thirteenth to the twentieth century; on the contrary, he works with facts and principles similar to those that would be revealed in the description of an existing Bantu language, Attic Greek of 400 b.c. or present-day French, for that matter. These diverse descriptions would be based on similar relations; if each idiom is a closed system, all idioms embody certain fixed principles that the linguist meets again and again in passing from one to another, for he is staying in the same class. Historical study is no different. Whether the linguist examines a definite period in the history of French (for example, from the thirteenth to the twentieth century) Javanese, or any other language whatsoever, everywhere he works with similar facts which he needs only compare in order to establish the general truths of the diachronic class. The ideal would be for each scholar to devote himself to one field of investigation or the other and deal with the largest possible number of facts in this class; but it is very difficult to command scientifically such different languages. Against this, each language in practice forms a unit of study, and we are induced by force of circumstances to consider it alternately from the historical and static viewpoints. Above all else, we must never forget that this unit is superficial in theory, whereas the diversity of idioms hides a profound unity. Whichever way we look in studying a language, we must put each fact in its own class and not confuse the two methods. The two parts of linguistics respectively, as defined, will be the object of our study. Synchronic linguistics will be concerned with the logical and psychological relations that bind together coexisting terms and form a system in the collective mind of speakers. Diachronic linguistics, on the contrary, will study relations that bind together successive terms not perceived by the collective mind but substituted for each other without forming a system. The study of static linguistics is generally much more difficult than the study of historical linguistics. Evolutionary facts are more concrete and striking; their observable relations tie together successive terms that are easily grasped; it is easy, often even amusing, to follow a series of changes. But the linguistics that penetrates values and coexisting relations presents much greater difficulties. In practice a language-state is not a point but rather a certain span of time during which the sum of the modifications that have supervened is minimal. The span may cover ten years, a generation, a century, or even more. It is possible for a language to change hardly at all over a long span and then to undergo radical transformations within a few years. Of two languages that exist side by side during a given period, one may evolve drastically and the other practically not at all; study would have to be diachronic in the former instance, synchronic in the latter. An absolute state is defined by the absence of changes, and since language changes somewhat in spite of everything, studying a language-state means in practice disregarding changes of little importance, just as mathematicians disregard infinitesimal quantities in certain calculations, such as logarithms. The signs that make up language are not abstractions but real objects; signs and their relations are what linguistics studies; they are the concrete entities of our science. (1) The linguistic entity exists only through the associating of the signifier with the signified. Whenever only one element is retained, the entity vanishes; instead of a concrete object we are faced with a mere abstraction. We constantly risk grasping only a part of the entity and thinking that we are embracing it in its totality; this would happen, for example, if we divided the spoken chain into syllables, for the syllable has no value except in phonology. A succession of sounds is linguistic only if it supports an idea. Considered independently, it is material for a physiological study, and nothing more than that. The same is true of the signified as soon as it is separated from its signifier. Considered independently, concepts like "house," "white," "see," etc. belong to psychology. They become linguistic entities only when associated with sound-images; in language, a concept is a quality of its phonic substance just as a particular slice of sound is a quality of the concept. The two-sided linguistic unit has often been compared with the human person, made up of the body and the soul. The comparison is hardly satisfactory. A better choice would be a chemical compound like water, a combination of hydrogen and oxygen; taken separately, neither element has any of the properties of water. (2) The linguistic entity is not accurately defined until it is delimited, i.e. separated from everything that surrounds it on the phonic chain. These delimited entities or units stand in opposition to each other in the mechanism of language. One is at first tempted to liken linguistic signs to visual signs, which can exist in space without becoming confused, and to assume that separation of the significant elements can be accomplished in the same way, without recourse to any mental process. The word "form," which is often used to indicate them (cf. the expression "verbal form," "noun form") gives support to the mistake. But we know that the main characteristic of the sound-chain is that it is linear. Considered by itself, it is only a line, a continuous ribbon along which the ear perceives no self-sufficient and clear-cut division; to divide the chain, we must call in meanings. When we hear an unfamiliar language, we are at a loss to say how the succession of sounds should be analyzed, for analysis is impossible if only the phonic side of the linguistic phenomenon is considered. But when we know the meaning and function that must be attributed to each part of the chain, we see the parts detach themselves from each other and the shapeless ribbon break into segments. Yet there is nothing material in the analysis. To summarize: language does not offer itself as a set of pre-delimited signs that need only be studied according to their meaning and arrangement; it is a confused mass, and only attentiveness and familiarization will reveal its particular elements. The unit has no special phonic character, and the only definition that we can give it is this: it is a slice of sound which to the exclusion of everything that precedes and follows -it in the spoken chain is the signifier of a certain concept. In most sciences the question of units never even arises: the units are delimited from the outset. In zoology, the animal immediately presents itself. Astronomy works with units that are separated in space, the stars. The chemist can study the nature and composition of potassium bichromate without doubting for an instant that this is a well-defined object. When a science has no concrete units that are immediately recognizable, it is because they are not necessary. In history, for example, is the unit the individual, the era, or the nation? We do not know. But what does it matter? We can study history without knowing the answer. But just as the game of chess is entirely in the combination of the different chesspieces, language is characterized as a system based entirely on the opposition of its concrete units. We can neither dispense with becoming acquainted with them nor take a single step without coming back to them; and still, delimiting them is such a delicate problem that we may wonder at first whether they really exist. Language then has the strange, striking characteristic of not having entities that are perceptible at the outset and yet of not permitting us to doubt that they exist and that their functioning constitutes it. Doubtless we have here a trait that distinguishes language from all other semiological institutions. To prove that language is only a system of pure values, it is enough to consider the two elements involved in its functioning: ideas and sounds. Psychologically our thought - apart from its expression in words - is only a shapeless and indistinct mass. Philosophers and linguists have always agreed in recognizing that without the help of signs we would be unable to make a clear-cut, consistent distinction between two ideas. Without language, thought is a vague, uncharted nebula. There are no pre-existing ideas, and nothing is distinct before the appearance of language. The characteristic role of language with respect to thought is not to create a material phonic means for expressing ideas but to serve as a link between thought and sound, under conditions that of necessity bring about the reciprocal delimitations of units. Thought, chaotic by nature, has to become ordered in the process of its decomposition. Neither are thoughts given material form nor are sounds transformed into mental entities; the somewhat mysterious fact is rather that "thought-sound" implies division, and that language works out its units while taking shape between two shapeless masses. 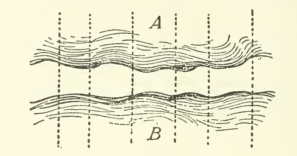 Visualize the air in contact with a sheet of water; if the atmospheric pressure changes, the surface of the water will be broken up into a series of divisions, waves; the waves resemble the union or coupling of thought with phonic substance. Language might be called the domain of articulations, using the word as it was defined earlier (see p. 10). Each linguistic term is a member, an articulus in which an idea is fixed in a sound and a sound becomes the sign of an idea. Language can also be compared with a sheet of paper: thought is the front and the sound the back; one cannot cut the front without cutting the back at the same time; likewise in language, one can neither divide sound from thought nor thought from sound; the division could be accomplished only abstractedly, and the result would be either pure psychology or pure phonology. Linguistics then works in the borderland where the elements of sound and thought combine; their combination produces a form, not a substance. These views give a better understanding of what was said before about the arbitrariness of signs. Not only are the two domains that are linked by the linguistic fact shapeless and confused, but the choice of a given slice of sound to name a given idea is completely arbitrary. If this were not true, the notion of value would be compromised, for it would include an externally imposed element. But actually values remain entirely relative, and that is why the bond between the sound and the idea is radically arbitrary. The arbitrary nature of the sign explains in turn why the social fact alone can create a linguistic system. The community is necessary if values that owe their existence solely to usage and general acceptance are to be set up; by himself the individual is incapable of fixing a single value. In addition, the idea of value, as defined, shows that to consider a term as simply the union of a certain sound with a certain concept is grossly misleading. To define it in this way would isolate the term from its system; it would mean assuming that one can start from the terms and construct the system by adding them together when, on the contrary, it is from the interdependent whole that one must start and through analysis obtain its elements. To develop this thesis, we shall study value successively from the viewpoint of the signified or concept (Section 2), the signifier (Section 3), and the complete sign (Section 4). Being unable to seize the concrete entities or units of language directly, we shall work with words. While the word does not con- form exactly to the definition of the linguistic unit (see p. 105), it at least bears a rough resemblance to the unit and has the advantage of being concrete; consequently, we shall use words as specimens equivalent to real terms in a synchronic system, and the principles that we evolve with respect to words will be valid for entities in general. Everything that has been said up to this point boils down to this : in language there are only differences. Even more important: a difference generally implies positive terms between which the difference is set up; but in language there are only differences without positive terms. Whether we take the signified or the signifier, language has neither ideas nor sounds that existed before the linguistic system, but only conceptual and phonic differences that have issued from the system. The idea or phonic substance that a sign contains is of less importance than the other signs that surround it. Proof of this is that the value of a term may be modified without either its meaning or its sound being affected, solely because a neighboring term has been modified (see p. 115). But the statement that everything in language is negative is true only if the signified and the signifier are considered separately; when we consider the sign in its totality, we have something that is positive in its own class. A linguistic system is a series of differences of sound combined with a series of differences of ideas; but the pairing of a certain number of acoustical signs with as many cuts made from the mass of thought engenders a system of values; and this system serves as the effective link between the phonic and psychological elements within each sign. Although both the signified and the signifier are purely differential and negative when considered separately, their combination is a positive fact; it is even the sole type of facts that language has, for maintaining the parallelism between the two classes of differences is the distinctive function of the linguistic institution. In a language-state everything is based on relations. How do they function? Relations and differences between linguistic terms fall into two distinct groups, each of which generates a certain class of values. The opposition between the two classes gives a better understanding of the nature of each class. They correspond to two forms of mental activity, both indispensable to the life of language. In discourse, on the one hand, words acquire relations based on the linear nature of language because they are chained together. This rules out the possibility of pronouncing two elements simultaneously. The elements are arranged in sequence on the chain of speaking. Combinations supported by linearity are syntagms. The syntagm is always composed of two or more consecutive units (e.g. French re-lire 're-read,' contre toes `against everyone,' la vie humaine `human life,' Dieu est bon `God is good,' s'il fait beau temps, nous sortirons `if the weather is nice, we'll go out,' etc.). In the syntagm a term acquires its value only because it stands in opposition to everything that precedes or follows it, or to both. Outside discourse, on the other hand, words acquire relations of a different kind. Those that have something in common are associated in the memory, resulting in groups marked by diverse relations. For instance, the French word enseignement `teaching' will unconsciously call to mind a host of other words (enseigner `teach,' renseigner `acquaint,' etc. ; or armement `armament,' changement `amendment,' etc. ; or education `education,' apprentissage 'apprenticeship,' etc.). All those words are related in some way. We see that the co-ordinations formed outside discourse differ strikingly from those formed inside discourse. Those formed outside discourse are not supported by linearity. Their seat is in the brain; they are a part of the inner storehouse that makes up the language of each speaker. They are associative relations. The syntagmatic relation is in praesentia. It is based on two or more terms that occur in an effective series. Against this, the associative relation unites terms in absentia in a potential mnemonic series. It is scarcely necessary to point out that the study of syntagms is not to be confused with syntax. Syntax is only one part of the study of syntagms. The set of phonic and conceptual differences that constitutes language results from two types of comparisons; the relations are sometimes associative, sometimes syntagmatic. The groupings in both classes are for the most part fixed by language; this set of common relations constitutes language and governs its functioning. The mechanism of language can be presented from another especially important angle. What diachronic linguistics studies is not relations between co- existing terms of a language-state but relations between successive terms that are substituted for each other in time. There is really no such thing as absolute immobility. Every part of language is subjected to change. To each period there corresponds some appreciable evolution. Evolution may vary in rapidity and intensity, but this does not invalidate the principle. The stream of language flows without interruption; Whether its course is calm or torrential is of secondary importance. Phonetics—and all of phonetics—is the prime object of diachronic linguistics. …. But sounds are not the only things that change with time. Words change their signification. Grammatical classes evolve. …. It is worth noting, however, that many changes often considered grammatical are really only phonetic. We saw earlier that a phonetic change affects not words but sounds. What is transformed is a phoneme. This event, though isolated like all other diachronic events, results in the identical alteration of all words containing the same phoneme. It is in this sense that phonetic changes are absolutely regular. The preceding examples have already shown that phonetic phenomena, far from always being absolute, are more often linked to fixed conditions. Putting it another way, what is transformed is not the phonological species but the phoneme as it occurs under certain conditions — its environment, accentuation, etc. For in- stance, s became r in Latin only between vowels and in certain other positions; elsewhere it remains (cf. est, senex, equos). Absolute changes are extremely rare. That changes often appear to be absolute is due to the obscure or extremely general nature of the conditions. An idle question, one might say; there is identity because the same slice of sound carries the same meaning in the two sentences. But that explanation is unsatisfactory, for if the correspondence of slices of sound and concepts is proof of identity, the reverse is not true. There can be identity without this correspondence. When Gentlemen! is repeated several times during a lecture, the listener has the feeling that the same expression is being used each time, and yet variations in utterance and intonation make for appreciable phonic differences in diverse contexts differences just as appreciable as those that elsewhere separate different words (cf. French pomme (`apple') and paume (`palm'), goutte (`drop') and je goute (`I taste'), fuir (`flee'), and fouir (`stuff'), etc. ); besides, the feeling of identity persists even though there is no absolute identity between one Gentlemen! and the next from a semantic viewpoint either. In the same vein, a word can express quite different ideas without compromising its identity (cf. French adopter une mode (`adopt a fashion') and adopter un enfant (`adopt a child'), la fleur du pommier (`the flower of the apple tree') and la fleur de la noblesse (`the flower of nobility'), etc.). The linguistic mechanism is geared to differences and identities, the former being only the counterpart of the latter. Everywhere then, the problem of identities appears; moreover, it blends partially with the problem of entities and units and is only a complication-illuminating at some points-of the larger problem. This characteristic stands out if we draw some comparisons with facts taken from outside speech. For instance, we speak of the identity of two "8:25 p.m. Geneva-to-Paris" trains that leave at twenty-four hour intervals. We feel that it is the same train each day, yet everything - the locomotive, coaches, personnel - is probably different. Or if a street is demolished, then rebuilt, we say that it is the same street even though in a material sense, perhaps nothing of the old one remains. Why can a street be completely rebuilt and still be the same? Because it does not constitute a purely material entity; it is based on certain conditions that are distinct from the materials that fit the conditions, e.g. its location with respect to other streets. Similarly, what makes the express is its hour of departure, its route, and in general every circumstance that sets it apart from other trains. Whenever the same conditions are fulfilled, the same entities are obtained. Still, the entities are not abstract since we cannot conceive of a street or train outside its material realization. Let us contrast the preceding examples with the completely different case of a suit which has been stolen from me and which I find in the window of a second-hand store. Here we have a material entity that consists solely of the inert substance-the cloth, its lining, its trimmings, etc. Another suit would not be mine regardless of its similarity to it. But linguistic identity is not that of the garment; it is that of the train and the street. Each time I say the word Gentlemen!I renew its substance; each utterance is a new phonic act and a new psychological act. The bond between the two uses of the same word depends neither on material identity nor on sameness in meaning but on elements which must be sought after and which will point up the true nature of linguistic units. What is a synchronic reality? To what concrete or abstract elements of language can the name be applied? Take as an example the distinction between the parts of speech. What supports the classing of words as substantives, adjectives, etc.? Is it done in the name of a purely logical, extra-linguistic principle that is applied to grammar from without like the degrees of longitude and latitude on the globe? Or does it correspond to something that has its place in the system of language and is conditioned by it? In a word, is it a synchronic reality? The second supposition seems probable, but the first could also be defended. In the French sentence ces gants sont bon marche (`these gloves are cheap'), is bon marche an adjective? It is apparently an adjective from a logical viewpoint but not from the viewpoint of grammar, for bon marche fails to behave as an adjective (it is invariable, it never precedes its noun, etc. ); in addition, it is composed of two words. Linguistics accordingly works continuously with concepts forged by grammarians without knowing whether or not the concepts actually correspond to the constituents of the system of language. But how can we find out? And if they are phantoms, what realities can we place in opposition to them? To be rid of illusions we must first be convinced that the concrete entities of language are not directly accessible. If we try to grasp them, we come into contact with the true facts. Starting from there, we can set up all the classifications that linguistics needs for arranging all the facts at its disposal. On the other hand, to base the classifications on anything except concrete entities-to say, for example, that the parts of speech are the constituents of language simply because they correspond to categories of logic-is to forget that there are no linguistic facts apart from the phonic substance cut into significant elements. Not every idea touched upon in this chapter differs basically from what we have elsewhere called values. A new comparison with the set of chessmen will bring out this point. Take a knight, for instance. By itself is it an element in the game? Certainly not, for by its material make - up-outside its square and the other conditions of the game - it means nothing to the player; it becomes a real, concrete element only when endowed with value and wedded to it. Suppose that the piece happens to be destroyed or lost during a game. Can it be replaced by an equivalent piece? Certainly. Not only another knight but even a figure shorn of any resemblance to a knight can be declared identical provided the same value is attributed to it. We see then that in semiological systems like language, where elements hold each other in equilibrium in accordance with fixed rules, the notion of identity blends with that of value and vice versa. In a word, that is why the notion of value envelopes the notions of unit, concrete entity, and reality. But if there is no fundamental difference between these diverse notions, it follows that the problem can be stated successively in several ways. Whether we try to define the unit, reality, concrete entity, or value, we always come back to the central question that dominates all of static linguistics. It would be interesting from a practical viewpoint to begin with units, to determine what they are and to account for their diversity by classifying them. It would be necessary to search for the reason for dividing language into words-for in spite of the difficulty of defining it, the word is a unit that strikes the mind, something central in the mechanism of language-but that is a subject which by itself would fill a volume. Next we would have to classify the subunits, then the larger units, etc. By determining in this way the elements that it manipulates, synchronic linguistics would completely fulfill its task, for it would relate all synchronic phenomena to their fundamental principle. It cannot be said that this problem has ever been faced squarely or that its scope and difficulty have been understood; in the matter of language, people have always been satisfied with ill-defined units. Still, in spite of their capital importance, it is better to approach the problem of units through the study of value, for in my opinion value is of prime importance. Romance studies, begun by Diez-his Grammatik der romanischen Sprachen dates from 1836-38-were instrumental in bringing linguistics nearer to its true object. For Romance scholars enjoyed privileged conditions that were unknown to Indo-European scholars. They had direct access to Latin, the prototype of the Romance languages, and an abundance of texts allowed them to trace in detail the evolution of the different dialects; these two circumstances narrowed the field of conjecture and provided a remarkably solid frame for all their research. Germanic scholars were in a similar situation. Though they could not study the prototype directly, numerous texts enabled them to trace the history of the languages derived from Proto-Germanic through the course of many centuries. The Germanic scholars, coming to closer grips with reality than had the first Indo-European scholars, reached different conclusions. At the very beginning of the literary period (about 800) the y became so weak that no trace of it appears in writing for three centuries; still, a slight trace had remained in the spoken form; that is how it miraculously reappeared as an umlaut around 1180! Without the help of writing, a slight difference in pronunciation was accurately transmitted. Still, abrupt transitions from one language to another are common, due to circumstances that have destroyed imperceptible transitions. The most disrupting force is the shifting of populations. Nations have always shuttled back and forth. Their migrations, multiplied throughout the centuries, have wrought confusion everywhere, and at many points all trace of linguistic transition has been wiped out.